Plato listed the ten sons of Poseidon as five pairs of twins. He seemed to imply that Poseidon favored the first born of each set of twins. 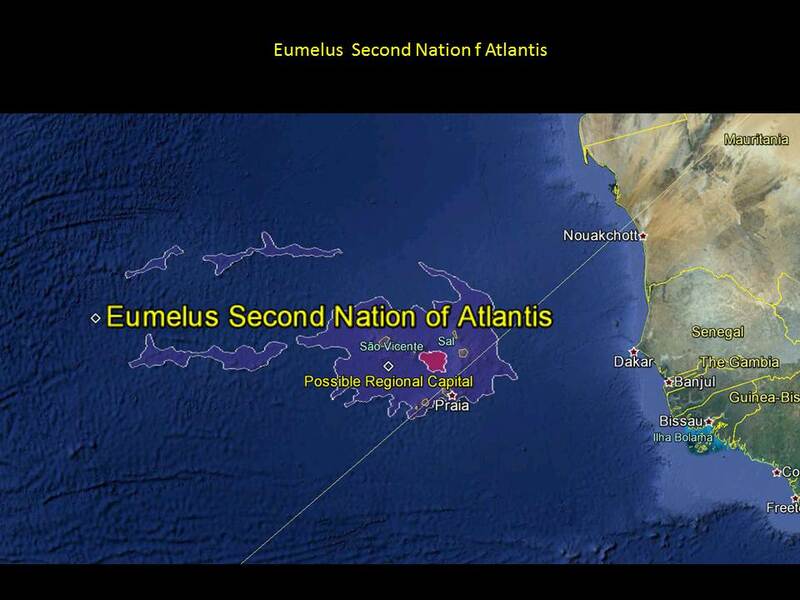 If true, then younger twin Eumelus would have gotten a smaller country than his older brother Atlas. I guessed Eumelus was placed far away from his older brother’s country to prevent rivalry. Plato called Eumelus by another name; Gaderius. Gaderius sounded similar to the old Roman name for France: Gaul. Maybe survivors from the destroyed country of Eumelus / Gaderius landed on the coast of Gaul / France ? I hunted for an sunken island grouping off the coast of Europe and settled on the Cape Verde Islands. These Islands are volcanic. They were explored by the Phoenicians. They were uninhabited until the 1500’s. I would suspect that if there was a country here, it was burned and buried at the end of the Second Age by a massive volcanic eruption and then drowned by the rising Atlantic Ocean. I doubt any evidence is left of Eumelus / Gaderius if this is where Poseidon’s second son was forced to establish his part of Atlantis.